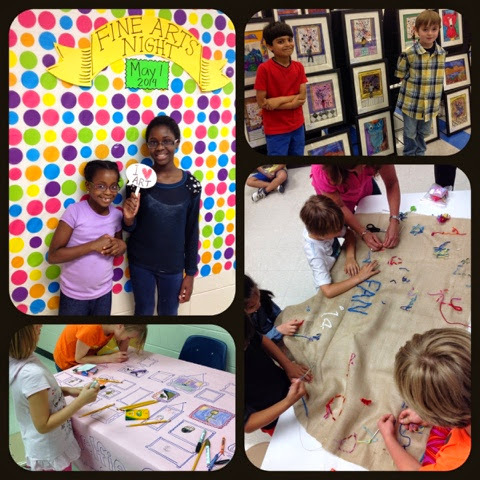 Mrs. Knight's Smartest Artists: Best Fine Arts Night ever! 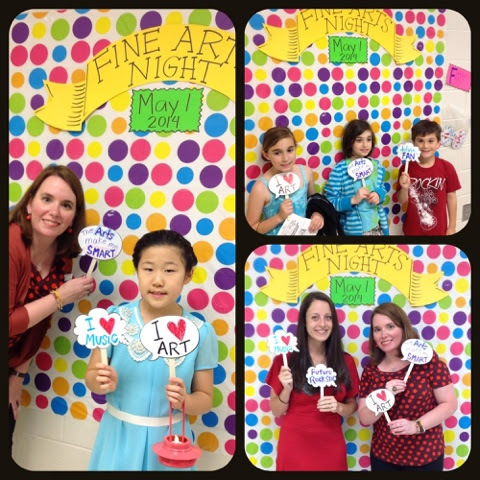 Best Fine Arts Night ever! 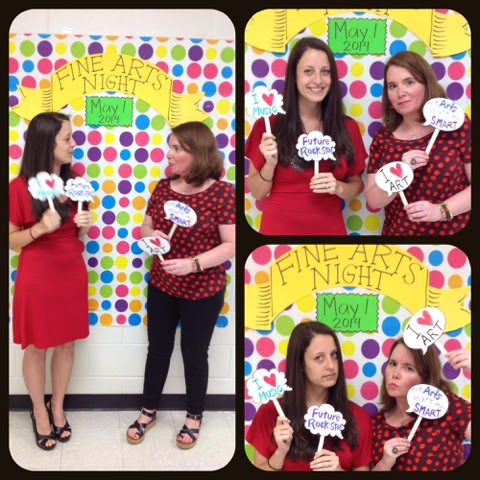 Fine Arts Night '14 is in the books, and I think it was the best one to date - so much to hear, see, do! 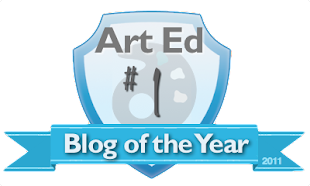 This music and art celebration is a tradition every year, but this time around the music teacher and I added a few new exciting components as you will soon see, starting with a push for families to share on social networking sites to expand our audience. 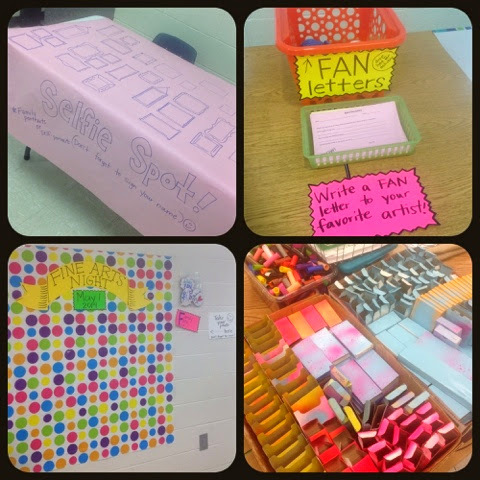 We placed posters all around with our blogging, Twitter, and Instagram accounts posted with QR codes for quick access (#dolvinFAN). We set up a live stream of the chorus concert for families to watch from wherever they were, and we could watch live from the art show at the opposite end of the building - very cool indeed. 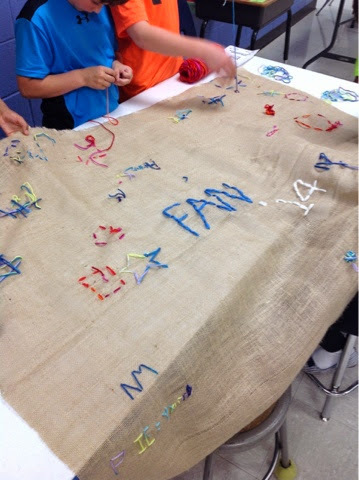 This graffiti stitching station was such a hit and it really thrilled me to walk by and see a half dozen kids at once, sitting around this burlap sheet sewing together! Such a great skill to know and a wonderful tradition to honor in this age of technology. Free Art Friday station - yes! 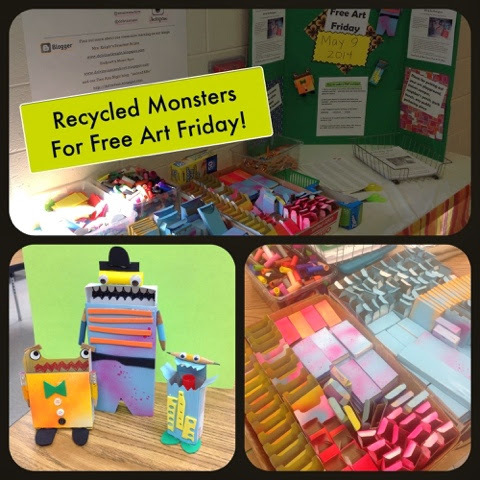 Next week I will be posting the details on this one, but basically we organized a bunch of saved recyclables in the art room and the kids made themselves a kit to take home to build a monster, which will be "dropped" next Friday for our event. 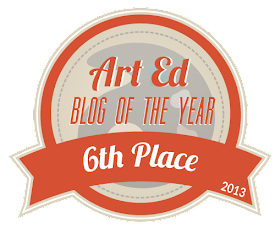 See the sidebar label "Free Art Friday" for a breakdown from last year. 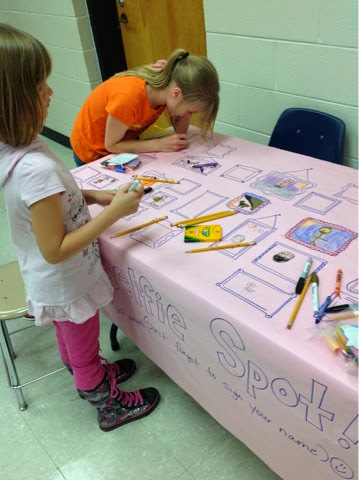 The Selfie Spot was stolen from the Thomas Elementary Art blog and the kids were filling them up faster than my 17 yo daughter Kinsey could crank them out! 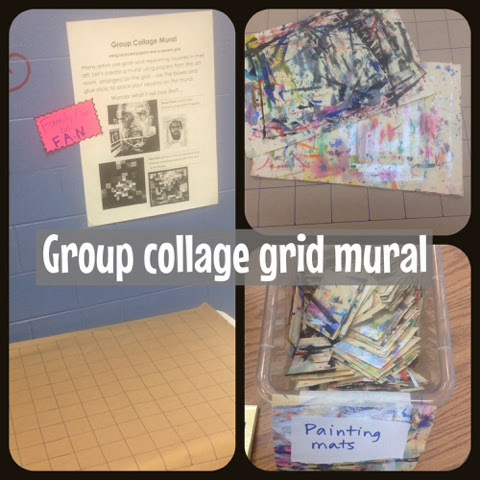 We also tried a grid collage mural based on Chuck Close and Paul Klee's works - this one needs a little editing before I post the result ;). I cut all of our painting mats from the year into 3" squares for this and I fell in love with them - maybe I'll wallpaper my powder room? Artist Fan letters were also fun - I expected parents to write them, which they did, but it surprised me to find a number of very sweet friend-to-friend notes, including one above for a friend in the hospital. Lainey always has the best ideas. 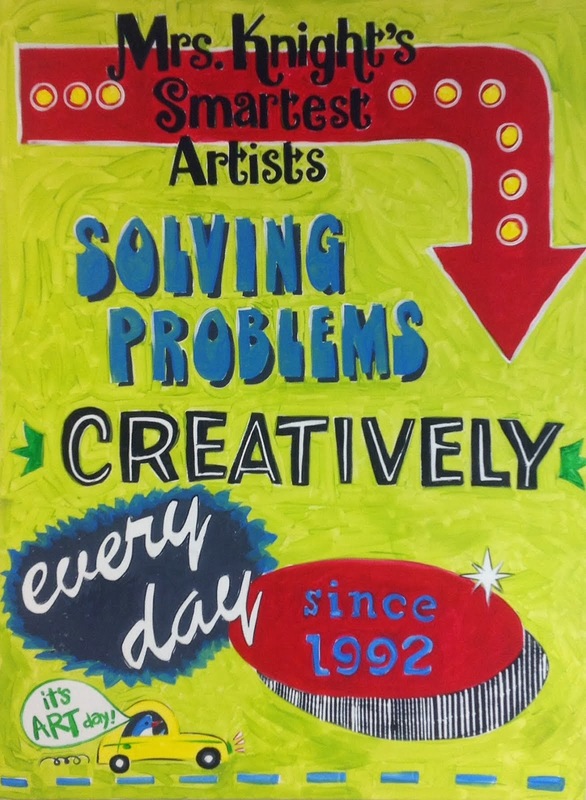 **update - these letters are available on my Teachers Pay Teachers store - http://www.teacherspayteachers.com/Store/Mrs-Knights-Smartest-Artists. 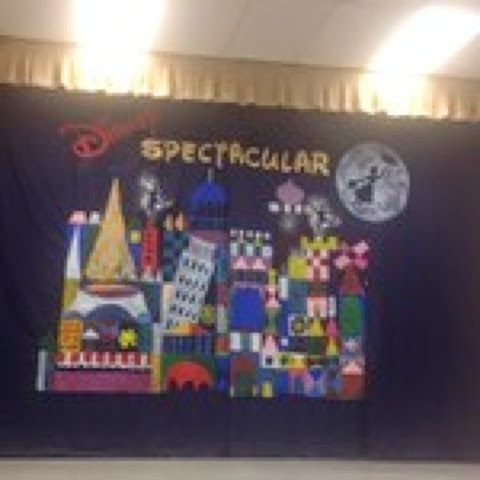 The chorus concert was called Disney Spectacular, and we all pitched in to paint a Mary Blair inspired backdrop, a premiere illustrator for Disney. I love the Mary Poppins figure flying over the moon and here are a couple of chimney sweeps that stopped by the art show post concert. 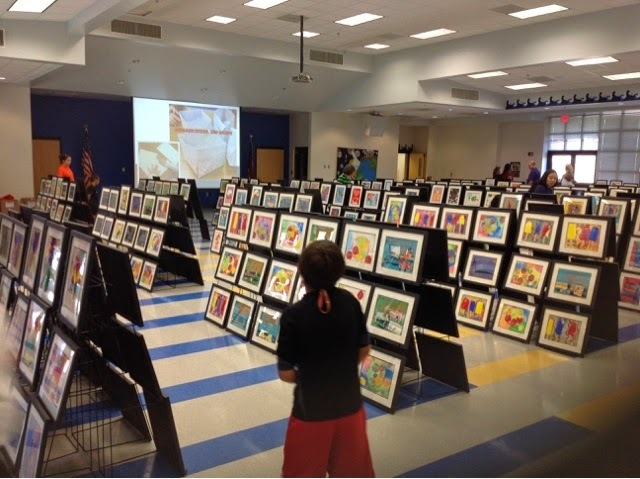 I will end the post with some pics from the art show itself and a few other shots. The frames are provided by the Artome company - they really make a professional looking show. 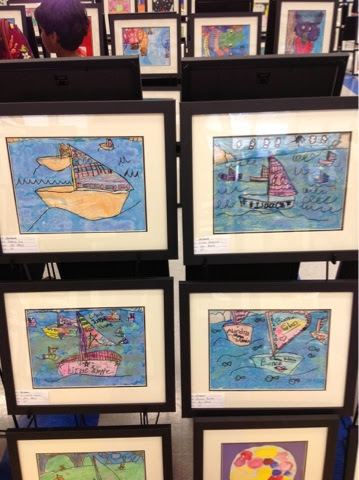 Frames are available for purchase for $25, although the art is not for sale - it belongs to the artists! 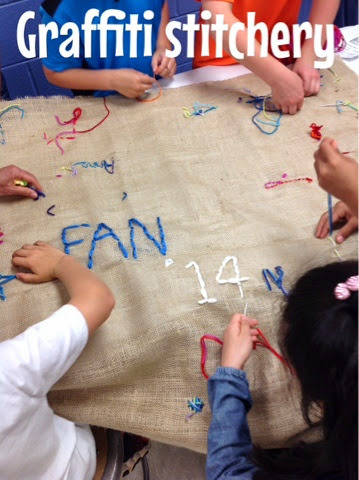 Thanks so much for being a part of our online audience! Wow! 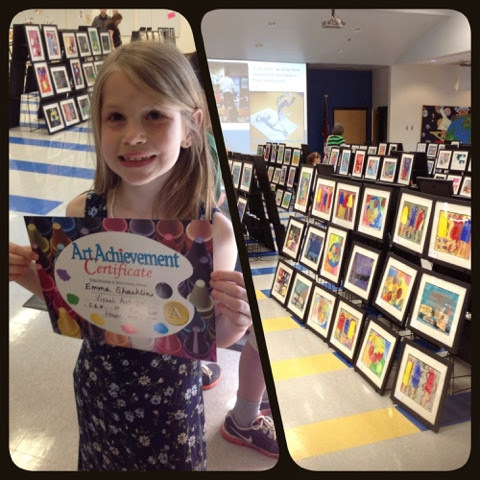 What an awesome art show! 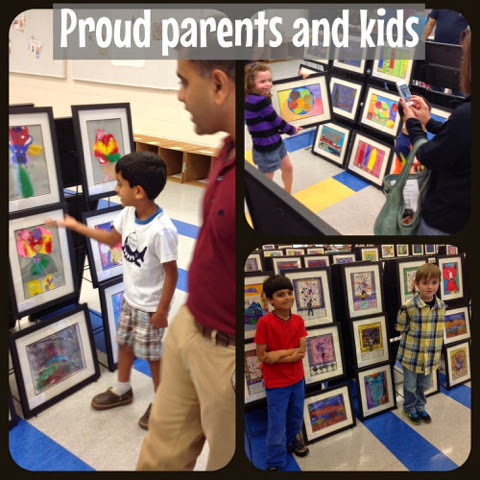 Your students' art looked great framed...like a real gallery. 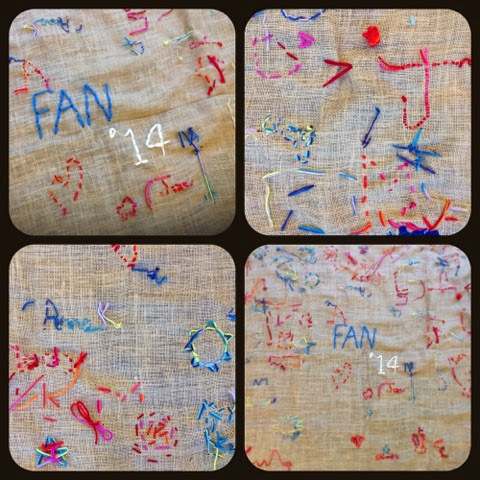 Your stitched graffiti looks so fun and engaging...(what needles did you use??). 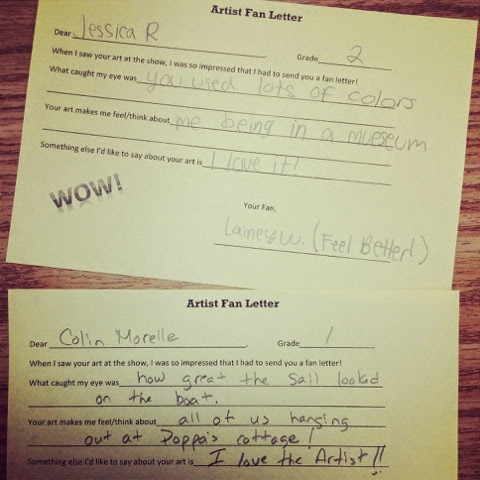 It is so nice to write artist fan letters to your friends. 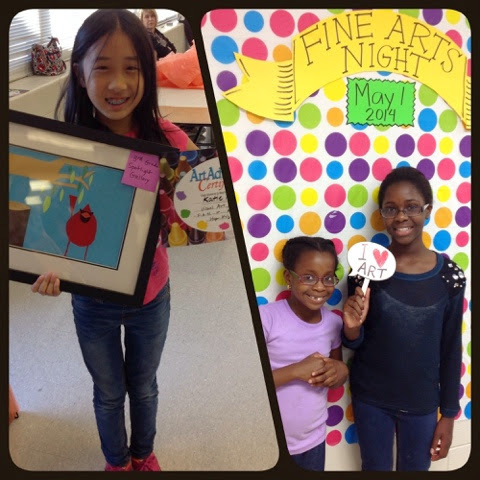 I may borrow these ideas for my art show later this month! Great work everyone! Hi Rina - wwe used the large metal tapestry needles with the large eyes and dull tips. 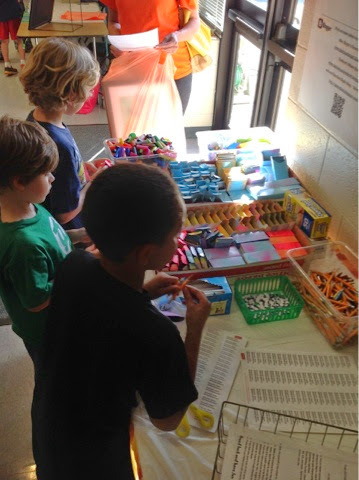 There was an adult monitoring that station at all times to help out. Best of luck with your show! 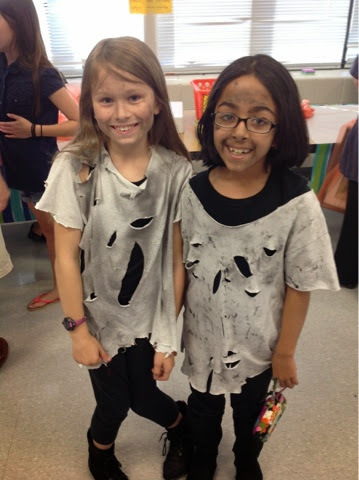 You & Megan did an AMAZING job - parents were so complimentary of the creativity your hard work generates in their children. Bravo! Dolvin is so lucky to have you both! What GREAT ideas! I can tell it took a lot of thought and planning. Looks like it was a huge success! Your show looks fantastic! 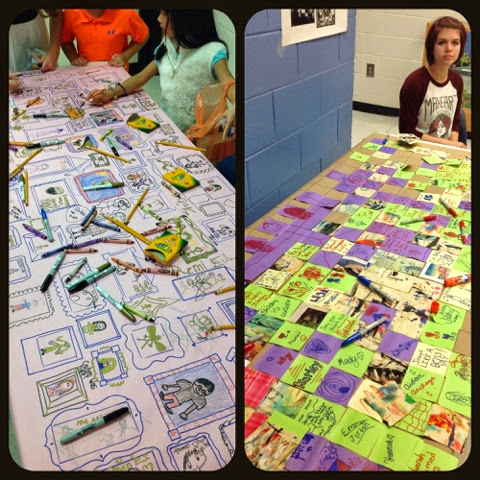 Great work by all! I love your display! Bravo!! What did all of the photo props say? I'd like to borrow that idea for my fine arts show in May 2018. Oh, I forgot to ask, did you just use wrapping paper as your backdrop? 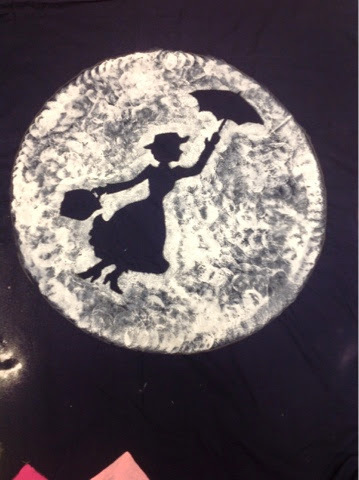 It was a plastic tablecloth I think! Hi, love your art work display! 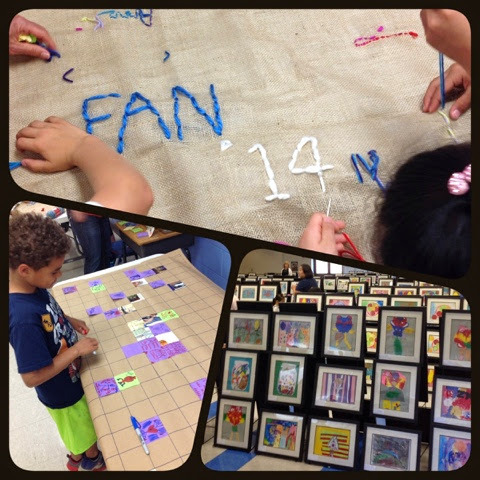 Do you reuse the frames every year or can the students take them home? 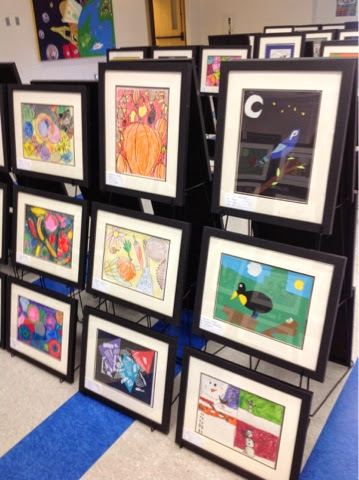 The frames are from a company called Artome - they frame all the work and set the show up and families can purchase the frames at the show. After the show, they take it all down and give me back the remaining art, which I send home. We earn about $6 per frame sale. Thanks Mister Rogers and happy summer, neighbors!